Transport Layer Security (TLS) and its predecessor, Secure Sockets Layer (SSL), are cryptographic protocols designed to provide communication security over the Internet. They use X.509 certificates and hence asymmetric cryptography to authenticate the counterparty with whom they are communicating, and to exchange a symmetric key. This session key is then used to encrypt data flowing between the parties. TLS is an Internet Engineering Task Force (IETF,) standards track protocol, first defined in 1999. It is based on the earlier SSL specifications (1994) developed by Netscape Communications. When the SSL protocol was standardized by the IETF, it was renamed to Transport Layer Security (TLS). As a consequence of choosing X.509 certificates, certificate authorities and a public key infrastructure are necessary to verify the relation between a certificate and its owner, as well as to generate, sign, and administer the validity of certificates. Negotiating a secure TLS tunnel is a complicated process, and there are many ways to get it wrong. It is important to realize that every TLS connection will require up to two extra roundtrips on top of the TCP handshake—that’s a long time to wait before any application data can be exchanged. If not managed carefully, delivering application data over TLS can add hundreds, if not thousands of milliseconds of network latency. Before the client and the server can begin exchanging application data over TLS, the encrypted tunnel must be negotiated: the client and the server must agree on the version of the TLS protocol, choose the ciphersuite, and verify certificates if necessary. Unfortunately, each of these steps requires new packet roundtrips between the client and the server, which adds startup latency to all TLS connections. 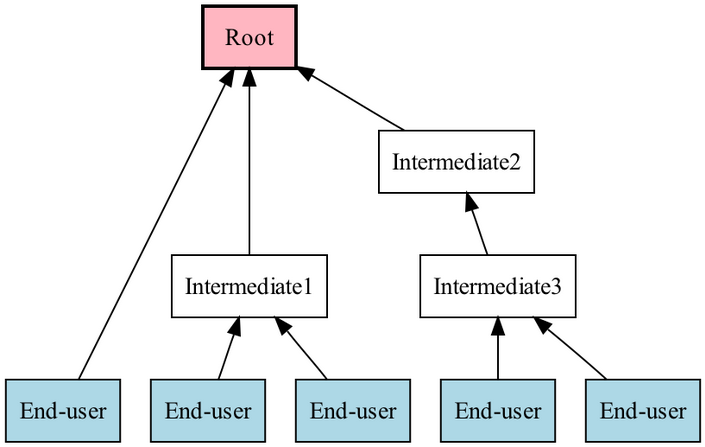 There are two types of certificate authorities (CAs), root CAs and intermediate CAs. In order for a certificate to be trusted that certificate must have been issued by a CA that is included in the trusted store of the device that is connecting. A CA bundle is a file that contains both root and intermediate certificates. Extended Validation SSL certificates require the use of two CA certificates to be installed on the web server; the Extended Validation Root CA certificate and the Extended Validation Intermediate CA certificate. Read more about the installation of root and intermediate certificates. Modern software-based TLS implementations running on commodity CPUs are fast enough to handle heavy HTTPS traffic load without needing to resort to dedicated cryptographic hardware. Rough memory usage numbers shows that by disabling TLS compression you save a lot of memory. The server uses a hostname presented by the client as part of the protocol (for HTTP the name is presented in the host header). However when using HTTPS the TLS handshake happens before the server sees any HTTP headers. Therefore it is not possible for the server to use the information in the HTTP host header to decide which certificate to present and as such only names covered by the same certificate can be served from the same IP address. In order to provide the server name, RFC 4366 Transport Layer Security (TLS) Extensions allow clients to include a Server Name Indication extension (SNI) in the extended ClientHello message. This extension hints the server immediately which name the client wishes to connect to, so the server can select the appropriate certificate to send to the client. A cipher suite is a named combination of authentication, encryption, and message authentication code (MAC) algorithms used to negotiate the security settings for a network connection using the Transport Layer Security (TLS) / Secure Sockets Layer (SSL) network protocol. When a TLS connection is established, a handshaking, known as the TLS Handshake Protocol, occurs. Within this handshake, a client hello (ClientHello) and a server hello (ServerHello) message are passed. First, the client sends a cipher suite list, a list of the cipher suites that it supports, in order of preference. Then the server replies with the cipher suite that it has selected from the client cipher suite list. A Certificate Signing request (CSR) is a block of encrypted text that is generated on the server that the certificate will be used on. It contains information that will be included in your certificate such as your organization name, common name (domain name), locality, and country. It also contains the public key that will be included in your certificate. A private key is usually created at the same time that you create the CSR. A certificate authority will use a CSR to create your SSL certificate, but it does not need your private key. You need to keep your private key secret. What is a CSR and private key good for if someone else can potentially read your communications? The certificate created with a particular CSR will only work with the private key that was generated with it. So if you lose the private key, the certificate will no longer work. Because TLS belongs to a lower layer from the application protocol point of view it is not possible to determine the protocol upfront. 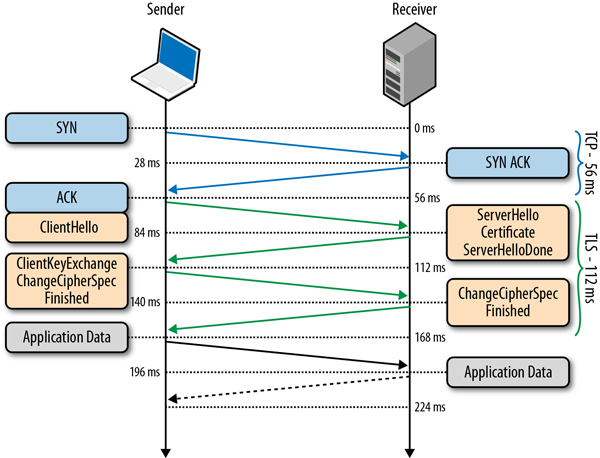 Application-Layer Protocol Negotiation (ALPN – successor of NPN) is a Transport Layer Security (TLS) extension for application layer protocol negotiation. 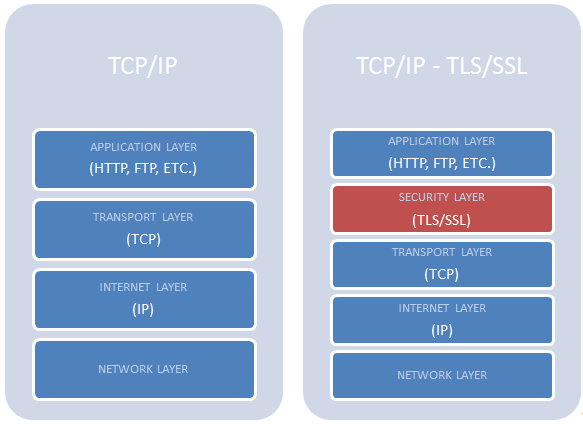 ALPN allows the application layer to negotiate which protocol should be performed over a secure connection in a manner which avoids additional round trips and which is independent of the application layer protocols. It is used by SPDY. Server Name Indication (SNI) is an extension to TLS that indicates to what hostname the client is attempting to connect at the start of the handshaking process. This allows a server to present multiple certificates on the same IP address and TCP port number. This will allow multiple secure (HTTPS) websites (or any other Service over TLS) to be served off the same IP address without requiring all those sites to use the same certificate. Many older clients (e.g., most IE versions running on Windows XP, Android 2.2, and others) do not support SNI. Clients which do not support SNI will be presented with a default certificate and hence are likely to receive certificate warnings, unless the server is equipped with a wildcard certificate that matches the name of the website. To address some of the limitations of the CRL mechanism, the Online Certificate Status Protocol (OCSP) was introduced. Note that some browsers distribute their own CRL lists, others fetch and cache the CRL files from the CAs. Similarly, some browsers will perform the real-time OCSP check but will differ in their behavior if the OCSP request fails. See figure beneath for a status list of important performance-oriented features: resumption, stapling, false start (requires NPN and forward secrecy), and support for SPDY and HTTP/2 protocols. False Start is an optional TLS protocol extension that allows the client and server to start transmitting encrypted application data when the handshake is only partially complete—i.e. once ChangeCipherSpec and Finished messages are sent, but without waiting for the other side to do the same. This optimization reduces new handshake overhead to one roundtrip. Note that Chrome will continue to use False Start with websites that have deployed Next Protocol Negotiation. For best results, both optimizations should be used together to provide a single roundtrip handshake for new and returning visitors, plus computational savings for sessions that can be resumed based on previously negotiated session parameters. Session resumption is a performance optimization that allows a client/server pair to re-use previously generated crypto material, so that they don’t have to compute new crypto keys every time a connection gets established. Because it greatly reduces the overhead caused by SSL/TLS, it’s a crucial server configuration in order to make SSL/TLS affordable. There exists two distinct ways to achieve session reuse: session identifiers and session tickets. Session resumption provides two important benefits: it eliminates an extra handshake roundtrip for returning visitors and reduces the computational cost of the handshake by allowing reuse of previously negotiated session parameters. However, it does not help in cases where the visitor is communicating with the server for the first time, or if the previous session has expired. To get the best of both worlds—a one roundtrip handshake for new and repeat visitors, and computational savings for repeat visitors—we can use TLS False Start, which is an optional protocol extension that allows the sender to send application data when the handshake is only partially complete. To enable TLS False Start across all browsers the server should advertise a list of supported protocols via the NPN/ALPN extension—e.g. 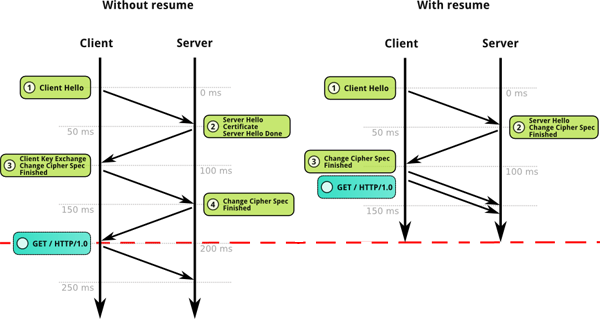 “http/1, http/1.1″—and be configured to support and prefer cipher suites that enable forward secrecy. Session Identifiers allow the server to create and send a session identifier as part of its ServerHello message during the full TLS negotiation. The server could then maintain a cache of session IDs and the negotiated session parameters for each peer. 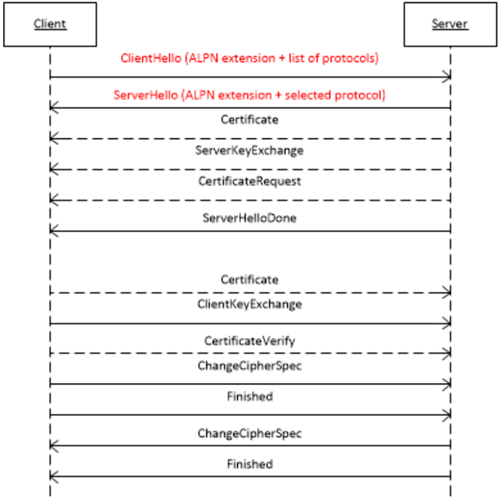 In turn, the client could then also store the session ID information and include the ID in the ClientHello message for a subsequent session, which serves as an indication to the server that the client still remembers the negotiated cipher suite and keys from previous handshake and is able to reuse them. Assuming both the client and the server are able to find the shared session ID parameters in their respective caches, then an abbreviated handshake can take place. Otherwise, a full new session negotiation is required, which will generate a new session ID. Leveraging session identifiers allows us to remove a full roundtrip, as well as the overhead of public key cryptography. However, one of the practical limitations of the Session Identifiers mechanism is the requirement for the server to create and maintain a session cache for every client. This results in several problems on the server, which may see tens of thousands or even millions of unique connections every day: consumed memory for every open TLS connection, a requirement for session ID cache and eviction policies, and nontrivial deployment challenges for popular sites with many servers, which should, ideally, use a shared TLS session cache for best performance. To address this concern for server-side deployment of TLS session caches, the Session Ticket replacement mechanism was introduced. None of the preceding problems are impossible to solve, and many high-traffic sites are using session identifiers successfully today. But for any multiserver deployment, session identifiers will require some careful thinking and systems architecture to ensure a well operating session cache. Session Tickets removes the requirement for the server to keep per-client session state (server-side session cache). Instead, if the client indicated that it supports Session Tickets, in the last exchange of the full TLS handshake, the server can include a New Session Ticket record, which includes all of the session data encrypted with a secret key known only by the server. This session ticket is then stored by the client and can be included in the SessionTicket extension within the ClientHello message of a subsequent session. Thus, all session data is stored only on the client, but the ticket is still safe because it is encrypted with a key known only by the server. Perfect Forward Secrecy (PFS) works by the idea that a compromise of the private key should not compromise session key. Forward secrecy is a property of key-agreement protocols ensuring that a session key derived from a set of long-term keys cannot be compromised if one of the long-term keys is compromised in the future. The key used to protect transmission of data must not be used to derive any additional keys, and if the key used to protect transmission of data is derived from some other keying material, then that material must not be used to derive any more keys. In this way, compromise of a single key permits access only to data protected by that single key. The Algorithm that helps to achieve this kind of perfect forward secrecy is called as Diffie–Hellman key exchange. If you’re willing to support both ECDHE and DHE, then you will probably be able to support forward secrecy with virtually all clients. But ECDHE alone is supported by all major modern browsers, which means that even with only ECDHE you might be able to cover a very large chunk of your user base. The decision what to do is entirely up to you. Google, for example, do not support any DHE suites on their main web sites. While accessing any HTTPs enabled websites, you can easily see the cipher suite used by selecting the LOCK icon beside the URL area. If you see something like TLS_ECDHE_ECDSA, its using PFS. The configuration differs slightly on each web server package. We will see how to enable this on Apache and Nginx. Nginx has this added advantage that if you are using SSL on it, it by default enforces PFS, by keeping the DH and Elliptical DH at a higher priority than other ciphers. However, please remember the fact that any web server that employs DH for PFS then there will be a slight performance degradation as the web server has to do a little bit more math. The below shown nginx configuration parameters are quite self explanatory. The only main thing that you need to note here is the order in which the cipher is mentioned. In apache, the configuration is exactly the same with only the parameter name difference. The apache configuration looks like the one shown below. SSLCipherSuite "EECDH+ECDSA+AESGCM EECDH+aRSA+AESGCM EECDH+ECDSA+SHA384 EECDH+ECDSA+SHA256 EECDH+aRSA+SHA384 EECDH+aRSA+SHA256 EECDH+aRSA+RC4EECDHEDH+aRSA RC4 !aNULL !eNULL !LOW !3DES !MD5 !EXP !PSK !SRP !DSS"
SSLProtocol all -SSLv2 -SSLv3 SSLHonorCipherOrder on SSLCipherSuite "EECDH+ECDSA+AESGCM EECDH+aRSA+AESGCM EECDH+ECDSA+SHA384 EECDH+ECDSA+SHA256 EECDH+aRSA+SHA384 EECDH+aRSA+SHA256 EECDH+aRSA+RC4EECDHEDH+aRSA RC4 !aNULL !eNULL !LOW !3DES !MD5 !EXP !PSK !SRP !DSS"
SSL termination refers to the process that occurs at the server end of an SSL connection, where the traffic transitions between encrypted and unencrypted forms. A device that handles both SSL offloading and SSL termination can be advantageous in some situations, such as high-performance large-scale clustering of SSL VPNs. HSTS converts the origin to an HTTPS-only destination and helps protect the application from a variety of passive and active network attacks against the user. Performance wise, it also helps eliminate unnecessary HTTP-to-HTTPS redirects by shifting this responsibility to the client, which will automatically rewrite all links to HTTPS. As of early 2013, HSTS is supported by Firefox 4+, Chrome 4+, Opera 12+, and Chrome and Firefox for Android. See complete list here. The “CRIME” attack, published in 2012, leverages TLS compression to recover secret authentication cookies and allows the attacker to perform session hijacking. Transport-level TLS compression is not content aware and will end up attempting to recompress already compressed data (images, video, etc.). Double compression will waste CPU time on both the server and the client, and the security breach implications are quite serious: disable TLS compression. In practice, most browsers disable support for TLS compression, but you should nonetheless also explicitly disable it in the configuration of your server to protect your users. After reading this article you should also watch this great presentation by Ilya Grigorik and read is website. Read Introducing Universal SSL by CloudFlare. Visit Qualys SSL Labs to test your server certificate and configuration. 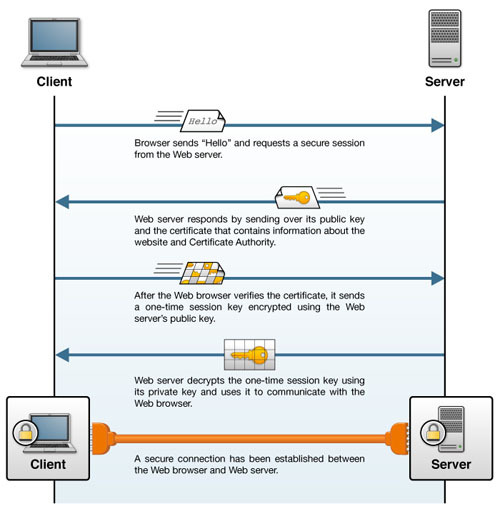 Read more on the Mozilla Wiki about configuration of TLS on servers.